It was Augustine who wrote, “There is a God-shaped vacuum in every man that only Christ can fill.” This statement captures the essence of an intimate relationship with the Lord…God has designed us to know Him and walk with Him closely. Too often, however, we seek to fill that God-shaped vacuum with other things, pursuits, relationships, and pleasures. Thus, we must constantly seek to have our spiritual thirsts slaked with the presence and power of Christ. 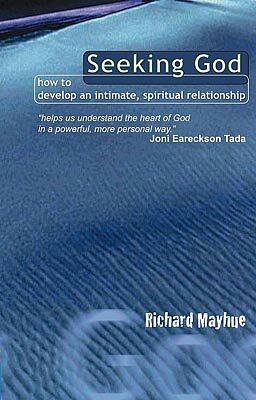 In his book Seeking God, Richard Mayhue helps us reclaim a sense of intimacy with God by pointing us back to His nature, His Word, His Spirit, and the many resources He provides to enable us to know Him. A helpful resource for both new and mature believers, this book charts a course that will reshape our souls and redirect our lives to know God as He intended us to know Him. As we head into summer, this would be a great read to keep your soul freshly informed with knowing and loving God!